Fuego in Guatemala is one of Central America’s most active volcanoes. For years, the towering Volcán de Fuego has puffed continuously, punctuated by occasional episodes of explosive activity, big ash plumes, lava flows, and avalanche-like debris slides known as pyroclastic flows. Just before noon on June 3, 2018, the volcano produced an explosive eruption that sent ash billowing thousands of meters into the air. A deadly mixture of ash, rock fragments, and hot gases rushed down ravines and stream channels on the sides of the volcano. Since these pyroclastic flows often move at speeds of greater than 80 kilometers (50 miles) per hour, they easily topple trees, homes, or anything else in their path. According to news reports, more than two dozen people were killed. As a precautionary measure, thousands of other people have been evacuated. Acquired June 3rd 2018 by the Visible Infrared Imaging Radiometer Suite (VIIRS) on Suomi NPP. 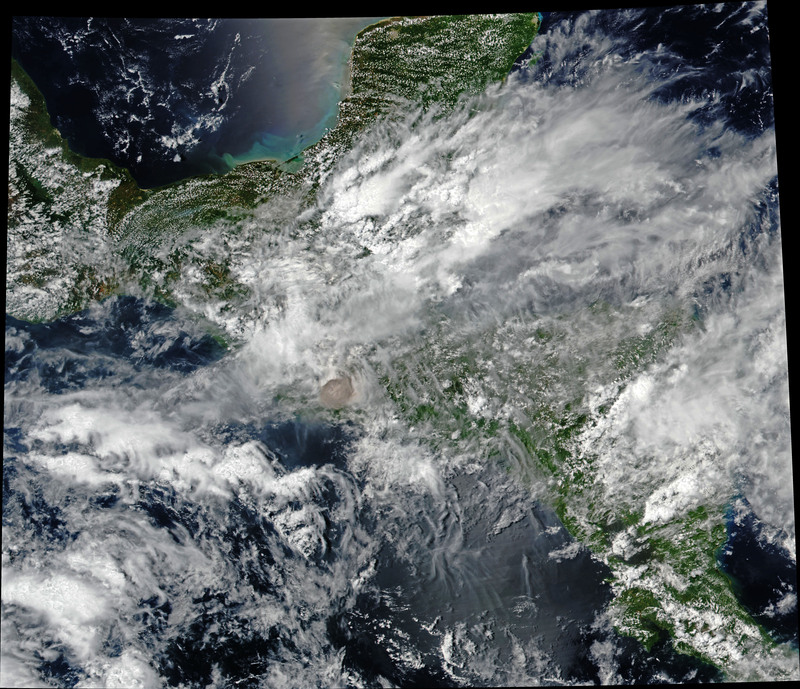 The Visible Infrared Imaging Radiometer Suite (VIIRS) on Suomi NPP acquired this image of the ash plume at 1 p.m. local time (19:00 Universal Time) on June 3, 2018, after the ash (brown) had punched through a deck of clouds. A report from the Washington Volcanic Ash Advisory Center estimated the plume’s maximum height at 15 kilometers (9 miles). Imagery from a geostationary satellite showed winds blowing the plume to the east. 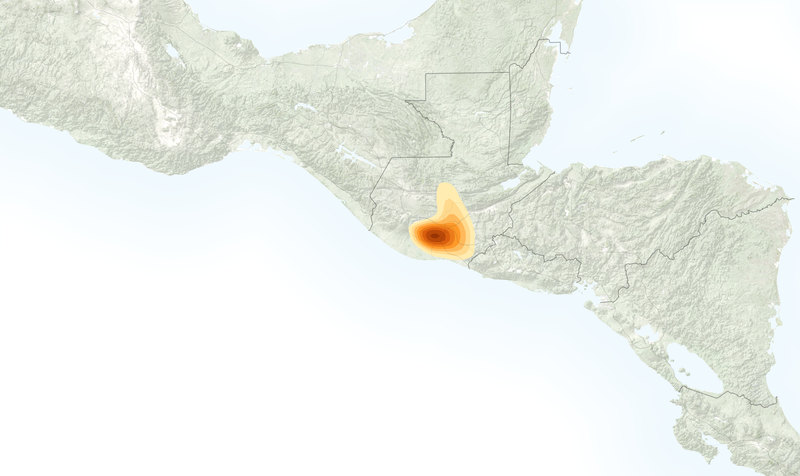 The eruption deposited ash on several communities surrounding the volcano, including Guatemala City, which is 70 kilometers (40 miles) to the east. In addition to ash, the plume contains gaseous components invisible to the human eye, including sulfur dioxide (SO2). The gas can affect human health—irritating the nose and throat when breathed in—and reacts with water vapor to produce acid rain. Sulfur dioxide also can react in the atmosphere to form aerosol particles, which can contribute to outbreaks of haze and sometimes cool the climate. Acquired June 3rd 2018 by the Ozone Mapping Profiler Suite (OMPS) on Suomi NPP. Satellite sensors such as the Atmospheric Infrared Sounder (AIRS) on the Aqua satellite and the Ozone Mapping Profiler Suite (OMPS) on Suomi NPP make frequent observations of sulfur dioxide. The map above shows concentrations of sulfur dioxide in the middle troposphere at an altitude of 8 kilometers (5 miles) as detected by OMPS on June 3. Discover (2018, June 4) Rocky Planet: Deadliest Eruption of 2018. Accessed June 4, 2018. NASA Global Sulfur Dioxide Monitoring Home Page. Accessed June 4, 2018. Smithsonian Institution Global Volcanism Program (2018) Fuego. Accessed June 4, 2018. The New York Times (2018, June 4) Guatemala’s Fuego Volcano Erupts, Killing at Least 33. Accessed June 4, 2018. U.S. Geological Survey Pyroclastic flows move fast and destroy everything in their path. Accessed June 4, 2018. Volcano Discovery (2018, June 4) Fuego volcano news & eruption update. Accessed June 4, 2018. NASA Earth Observatory images by Joshua Stevens, using VIIRS data from the Suomi National Polar-orbiting Partnership and OMPS data from the Goddard Earth Sciences Data and Information Services Center (GES DISC). Story by Adam Voiland.